Nothing left to do, shows are over so I’m headed home now. So far nothing crazy yet, prime time is the next 3-4 hours. All there is to do now is sit back and see what happens. If you extrapolate the leading edge of the solid gray lower-level clouds offshore, they should hit the coastline within the hour. That is the edge of the occlusion that should contain the very strong wind, so I’m extremely curious to see what happens with windspeeds out there when it hits from 10-11pm. Hold on if you are at the beaches! There has also been some lightning at times offshore in the unstable airmass to add to the drama. High Wind Warnings are up for all of NW Oregon and our viewing area in SW Washington too. Much stronger southwest wind between 10pm-2am in the western valleys. The wind will come and go with the showers (very gusty). Gusts 55-65 mph are possible, this is stronger than anything we’ve seen in our area since the Hanukkah Eve Storm in December 2006. Possibly the strongest since the January 2000 storm. Prepare for widespread power outages and downed trees. During the 2006 storm, PGE outages topped out over 200,000 customers! Most of those were back on within a day or so, but those of you in the outlying areas make sure your generator and chainsaw is working this afternoon. 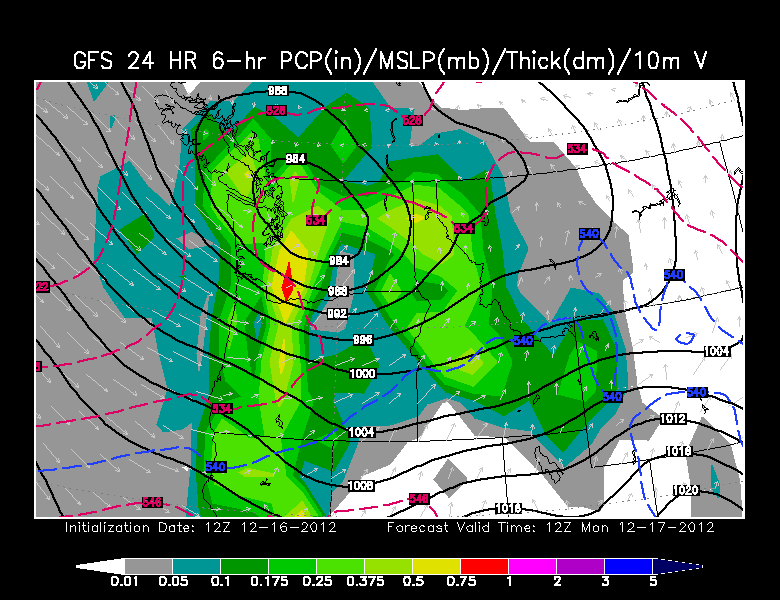 Oregon/Washington Coast gets a much stronger surge of SW wind 10pm-2am. Gusts 80-100 mph possible. By the way, my coworkers laughed at me when I mentioned I had a chainsaw in the backseat for the drive home; but I don’t want to get stuck 1 mile from home like I almost did last January. Can’t be too prepared. For those just wanting the basics, see the previous post’s headlines, the forecast is still the same. 1. The storm is still ON; strong and damaging wind from the occlusion hits the coast 10pm or just beyond, and into the Valleys 11pm or midnight. 2. Most 00z models are in and didn’t change a thing, in fact it appears the WRF-GFS is slightly stronger with incredible isobar packing centered right from Kelso to Eugene from 11pm-4am. Peak gradient appears to be midnight to 2am. 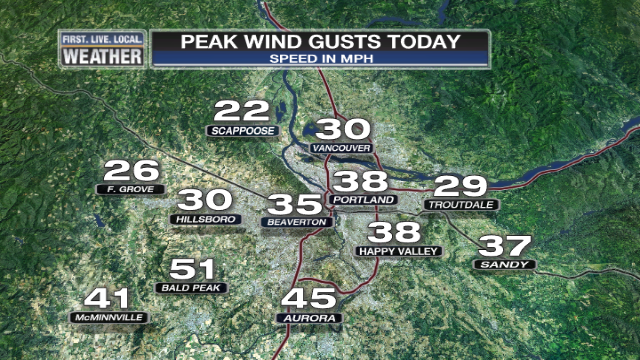 Salem to Portland will likely see the highest gusts, possibly some 60+ gusts at official observing stations. Our RPM has the strongest wind around 1-2am. The WRF-GFS has a 20mb or so gradient, very impressive. 1st surge of (relatively weak) wind has passed now, peak gusts were generally 55-75 at the beaches and 30-40 here in the metro area. Willamette Valley wind peaked between 40-50 mph. After that first surge, there are about 8000 PGE customers out of power. 2nd surge of wind is on the way, clearly seen on all models hitting the north Coast around 10-11pm. It should be absolutely ferocious out there as southwest winds average 50 mph with gusts in the 80+ range widespread up and down the beaches. That will move over the Coast Range and into the Valley 1-2 hours later. If you are in a neighborhood with large fir trees overhead, please be careful. If you can, sleep in a part of the house that isn’t just north or northeast of a tree. If you have to get up for work using an alarm, use your cell phone. A lot of us may wake up to dark and cold homes! The most powerful windstorm in at least 6 years is poised to hit us within the next 12 hours, that includes the Portland Metro Area! Much stronger southwest wind between 10pm-2am in the same areas. The wind will come and go with the showers. By daybreak Monday it’s over, just showers, sunbreaks, and breezy wind. Flooding rain or lowland snow is not an issue with this storm. Oregon Coast gets Southerly gusts 50-70 mph in the 3-7pm timeframe, then a much stronger surge of SW wind 10pm-2am. Gusts 80-100 mph possible, especially on the north Coast. What an exciting 24 hours we have ahead. It has been obvious for a few days that we have a wind “event” of some sort on the way tonight and tomorrow morning. But this morning the models made two significant changes that should push the wind higher than earlier anticipated. 1. The surface low currently tracking towards the coast is forecast to be a bit deeper (lower pressure) and farther south than earlier runs forecast. Plus, it doesn’t weaken dramatically until after it passes by now. A deep surface low tracking just to our north pulls up strong southerly wind through the Valley as it moves by. Air is rushing north to fill in that “hole” in the atmosphere. So now pressure gradient forecasts are in the 18-20 millibar range for Olympia to Eugene, but with most of the isobar packing from Kelso to Eugene instead of last time when it was further north. As noted in the previous post, this means we are well up into the 50+ mph gust forecast range. As this occurs, we’ll be in a showery and unstable air mass too, lifted index values are around zero. Instability helps the strong SW wind above surface during those showers. Most likely this will be one of those windstorms where the wind goes up and down dramatically. It’s going to be down to normal “windy” levels by daybreak, but by then the damage will be done. 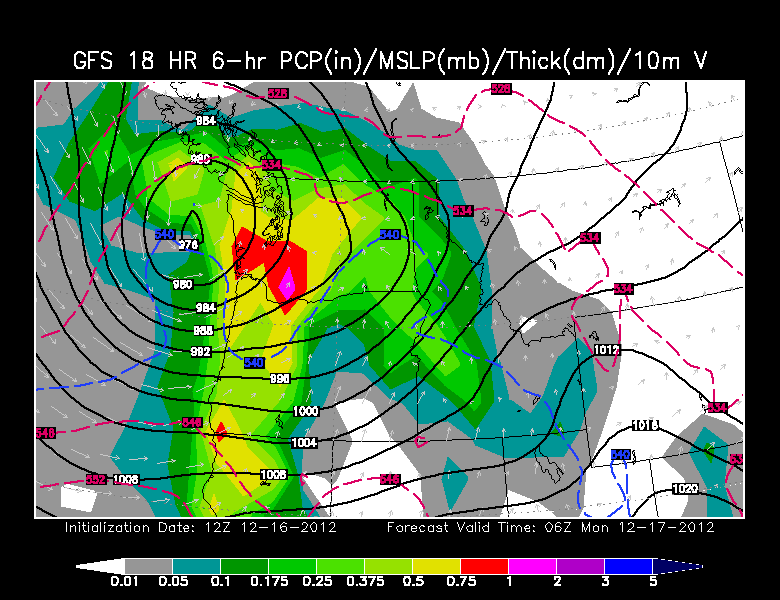 Just showers and sunbreaks tomorrow, oh, and 3-4 feet new snow in the Cascades the next 2 days! We’ll be on at 5pm and 10pm tonight, plus keep Facebook (FOX12WEATHER) and Twitter (FOX12WEATHER) updated. It’s going to be a long night! You are currently browsing the FOX 12 Weather Blog blog archives for the day Sunday, December 16th, 2012.